Use the DataView software to easily view and process any type of dBASE file. 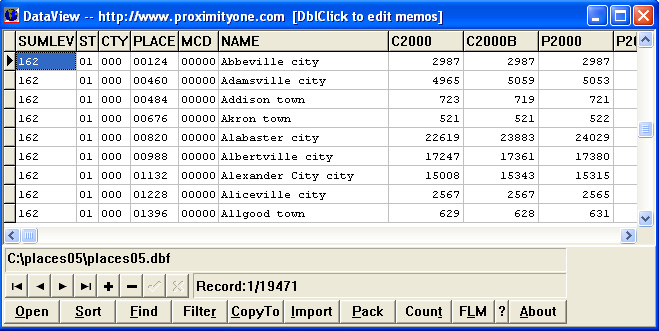 The following graphic shows DataView used to open/view the U.S. by city/place demographic estimates file.  Open -- open a database. The currently open database will be closed.  Sort -- specify a dBase expression for an index key.  Pack -- permanently remove the records marked as "Deleted"
 FLM -- Field List Manager; rearrange dbf fields in grid and hide them. ProximityOne develops geographic-demographic-economic data and analytical tools and helps organizations knit together and use diverse data in a decision-making and analytical framework. We develop custom demographic/economic estimates and projections, develop geographic and geocoded address files, and assist with impact and geospatial analyses. Wide-ranging organizations use our tools (software, data, methodologies) to analyze their own data integrated with other data. Contact us using this form or call (888) 364-7656 for more information.